When I spoke to Oyster's director/cinematographer and co-producer Kim Beamish recently, he had just heard the news, but it wasn't going to change his plans for the day. "It's unfortunate that we can't be there, but we've got to be here." He will be in Canberra that day, and will be present with his producer Pat Fiske for the Q&A. Chesapeake Bay, the largest estuary in the US, has seen the decline of the native oyster population through overharvesting, disease and habitat loss, though there has been some recovery in recent times. Oyster farmers the world over from North America, to Europe, to the far South Coast of NSW, where Oyster was filmed, are alert to the challenges they face from climate change. To make Oyster, Beamish has returned to his roots, at least to the place where his family holidayed when he was young. During those years, Beamish got to know Merimbula Lake, where Oyster was filmed, and the family oyster business now run by his old childhood friend, Dom Boyton, a second-generation oyster farmer, and his wife Pip, with assistance from their two young sons. "It's actually a story that began in Canberra, way back when." Before marriage and children, Kim's mother and Dom's mother had been close friends while they both worked at the National Library. When the Boytons moved to the coast, the families would get together during school holidays and the boys became childhood friends. "When I came up with the idea for the film, Dom was my instant go-to. I hadn't seen him for about 10 years, but during that time I'd been hearing about his trials and tribulations." 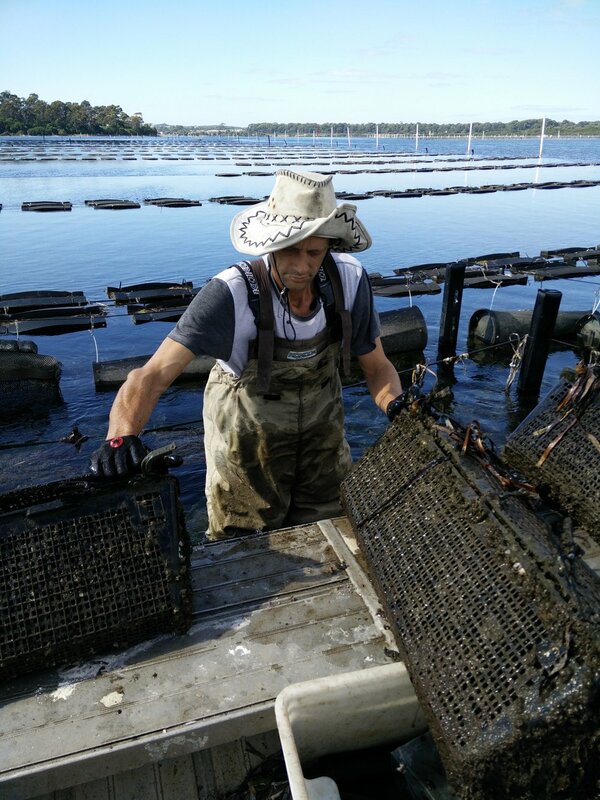 The Sydney Rock Oyster that Dom Boyton farms on his oyster lease at Merimbula Lake – there are millions of them – is vulnerable to pollution, salinity and changes in water temperature. It takes three years to mature for sale, twice as long as the non-native Pacific Oyster. How to then deal with global warming too? The trials and tribulations would still reach him while he was overseas. In 2011, Beamish was living in Egypt where his wife was posted for three years. It saw them and their children living in Cairo during the early rumblings of the Arab Spring. The doco he was making about a small group of textile artisans, known as tentmakers, was starting to take shape as a record of the impact of seismic political change. It was a gift. With the film that resulted, The Tentmakers of Cairo, Beamish achieved an international profile when he won awards such as the Margaret Mead filmmaker and Prix Buyens-Chagoll – Visions du Réel, in 2015. Rather like Oyster's focus on one family, The Tentmakers of Cairo also observes a small community, a microcosm that's affected by massive changes over which it had no control. What does Beamish think attracts him to observing the impact of major change on the individuals who have to live it? "Every day Dom and Pip wake up and have to work with what the weather and the environment brings. And so, they're the people who are at the coalface here," he explains. "While it's the scientists, politicians, activists, and environmentalists who are in the fray, the reality is that most of us just have to get on and work, to survive. That is, I suppose, the through-line between the two films." It's no surprise to hear that the type of documentary he prefers to make and watch is verité. That said, in the film about a women's AFL team that he is working on now, he will play with different styles. In The Tentmakers of Cairo there is no voice-of-god commentary and no music to manipulate viewer responses, only the immersive ambient sound that is heard in the markets. The observational style of filmmaking is not always well appreciated or understood, and yet it has worked very well for him. Some audiences may want the guidance of voiceover, more edits, a defined perspective and answers to questions raised, but observational filmmaking allows his subjects to speak for themselves, with minimal interference or input, either on set or in post-production. "Observational documentary brings you closer to the characters, and makes it easier to identify with them. I think that observational style is closer to the truth than other styles of documentary." Does he think it's similar to what sociologists and anthropologists do? "I think the ethnographic film has the camera on the outside looking in. I like to think that I'm involved in the situation and not just sitting on the outside looking it. I don't know if that works, but it's kind of how I feel." Like having a seat at the table? "Yes." So, what would he say to the people who can get a bit impatient with verité? "I think it's for people to make up their own minds. What I hope I'm offering is information for people to come to their own conclusions." Oyster will screen at Arc Cinema, National Film and Sound Archive, during the Canberra International Film Festival, at 5.45pm on Saturday, October 28. ciff.com.au.